The Arab-Israeli conflict is a protracted conflict that is unfolding for more than a century. All attempts to bring a peaceful solution of the conflict failed. The so-called Arab Spring, as well as fighting terrorism have moved the Arab-Israeli conflict to the sideline of international attention both regionally and internationally. Nevertheless, the Arab-Israeli conflict remains a major source of potential violence in the Middle East. The current policy of the United State is breaking all the red lines that previous US administrations have followed for decades including the refusal to move the US Embassy to Jerusalem. This policy will lead to an increase of violence and ruin the decades-long peace process. Could the increase of tension lead to a resumption of talks? The current situation in the occupied territories is tense. A new Intifadah is taking place. Shelling from Gaza to the Israeli territory became more frequent. The Israelis retaliate by airstrikes and military actions in the West bank. Tensions are very high due to the US policy on Jerusalem as well as the financial pressures on the UNRWA to bring the Palestinians to the negotiation table. The US is suggesting a great deal to solve the conflict but it is a one sided position in the interests of Israel. It looks like surrender of the Palestinians than a call for negotiations. All these developments will lead to more tensions and violence. The Palestinian Authority can not be brought to the negotiation table through such open pressures. This is impossible on the popular as well as on the political levels. Moreover, the issue of Jerusalem can not be bypassed by the Palestinian Authority. So, the peace process will register a major setback in case the Palestinian Authority decides to withdraw from negotiations. There are no ingredients to encourage Palestinians to go to the negotiation table. What measures can take the international mediators and the leading regional powers (Egypt, Jordan, Saudi Arabia)? The international community should provide a platform for mediators who need the support from the whole international community as well as the Security Council to proceed efficiently in their attempts to break a deal. -Work on easing tensions between the belligerents. -Work on improving living conditions in the Occupied Territories. -Make Israel follow the different agreements reached with the Palestinian Authority. -Put on the UN Security Council table decisions and different Arab initiatives, including the peace initiative adopted by the Arab Summit in Beirut, that emphasized the two states solution and the right of return for Palestinian refugees. -Bring the two parties to the negotiation table. As to the Arab states, mainly Egypt, Jordan and Saudi Arabia, it is important to mention that they are facing major internal economic, political and regional challenges. Thus, the Arab-Israeli conflict is “secondary” at this time. The priority for those states is fighting terrorism. -No Arab country can accept, that Jerusalem will be only the capital of Israel. Those countries support the two states solutions and minor changes to the 1967 boundaries. - Push the Palestinian Authority to reduce tensions. 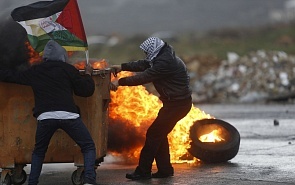 - Push the Palestinian Authority to resume talks with Israel. - Organize such talks in Jordan and/or Egypt. - Work together on the economic humanitarian’s level in cooperation with the United Nations, Palestinian Authority and other international institutions. Is it reasonable to begin talks on the Jerusalem status, and could an agreement on Jerusalem be reached without settlement of the other major issues of the conflict? The minimal acceptable solution for Palestinians’ and Arabs is the consecration of East Jerusalem as the capital of the future Palestinian state. In the Camp David Agreement the status of Jerusalem was left to further negotiations through the use of two Understandings: one claimed by Egypt that Jerusalem is the capital of the future Palestinian state and the second by Israel claiming the contrary. There have been calls to place Jerusalem under international control but it’s not a viable solution for the parties. There is a need to follow the UN Security Council decisions to envision a viable solution of the Arab-Israeli conflict. Unfortunately, the chances to resume talks are slim. Otherwise the conflict will continue due to the US and Israeli positions.